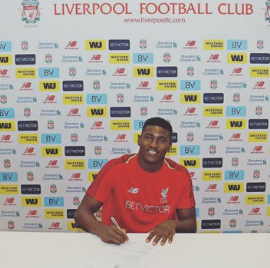 Allnigeriasoccer.com has been informed that Liverpool-owned striker Taiwo Awoniyi has been summoned by the Nigeria Football Federation for the U23 Africa Cup of Nations qualifiers against Libya this month. Barring any unforeseen circumstances, the in-form Royal Excel Mouscron man will get the nod of the coaching staff to lead the Olympic Eagles attack against the North Africans on March 20. Awoniyi previously collected caps for the Dream Team and was on the roster for the 2015 U23 Africa Cup of Nations. A year later, the 21-year-old was named to the provisional roster for the Olympic Games but could only make the standby list despite his goals qualifying the team for the competition. It would be Awoniyi's first international appearance for Nigeria in about three years if he gets game time against the North Africans. He has scored in each of his last five games for Royal Excel Mouscron in the Belgian First Division A.